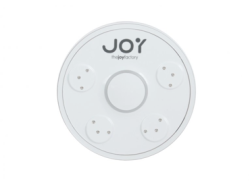 The The Joy Factory Zip Mini Touch-n-go Charging Station is similar in many ways to the Powermat charging concept. But this allows for a universal range of devices to be charged from it. 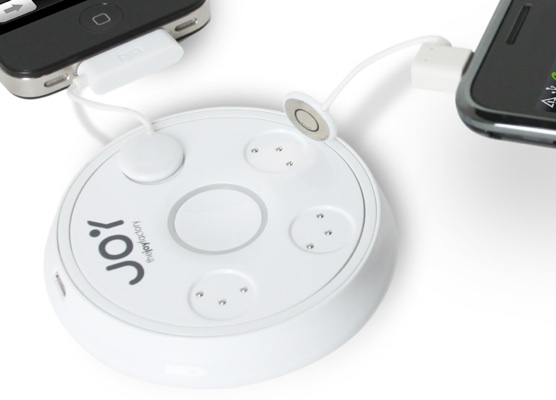 Two magnetic small in size and length charging cables which The Joy Factory dub Zip Tails are included within the box. One is a micro USB and the other is an Apple 30 pin dock connector. Other Zip Tails with a variety of connections can be purchased separately as the main charging unit has capacity for four to placed upon. I feel that four or maybe more with different connections should be included as this is the devices main objective. The units design is as simplistic as it’s concept and has rounded theme. The main unit is round and has four charging circles for the Zip Tails to placed upon. A circular green LED ring is present when the unit is on. And the base of the unit is lined in a grippy material which works well on my wooden desk where I use it mostly. It’s also very compact/ light weight and can fit into a pocket with ease. The Zip Tails are easy to place directly onto a charing circle as it’s magnetic and because a little cable length is present you can use the device freely whilst charging. I haven’t had the opportunity to charge more than two devices as I have just have the two Zip Tails and it charges two devices without any hassle or power problems. The clutter this takes away from a desk is quite impressive. It requires a cable to be entered to power the unit. This can be done via either a wall plug which is included within the box with a ton of different adapters for different regions throughout the world. Or you can use a USB cable but i’d recommend powering the unit with the wall plug as it charges your devices the fastest. I have mine tucked into the corner of my desk and it’s always on so I can just throw a device on. It’s out the way and reduces the amount of cables which would normally be on my desk too. Overall I have enjoyed using The Joy Factory Zip Mini Touch-n-go. It’s easy to use, has a small and pleasant design, charges with ease, you can use your device while it’s charging freely but more Zip Tails should definitely be included.